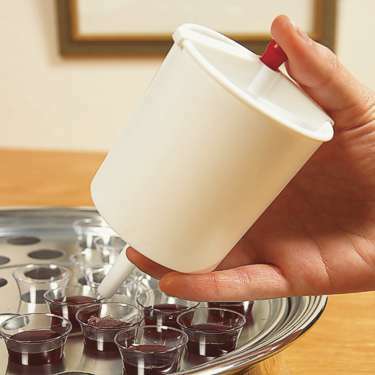 This lightweight cup filler is an efficient means of filling communion cups. No more spills, no more mess; just press and release the button to release the desired amount. The filler is made of polypropylene and has a 3-inch diameter. Holds enough juice (approximately 16 ounces) to fill approximately 22 cups. This product is made in the USA. Juice not included.